Handmade 18th century style solid oak three drawer potboard dresser (shown here in Wash Back Antique and medium aged). We have one example of this superb value-for-money piece of reproduction furniture, available now for immediate delivery, from our showroom stock, in 'Raw Sienna' colour and medium ageing (please contact us regarding availability, payment etc. on our immediate delivery furniture). For bespoke orders, delivery is usually around 8-12 weeks.Lead times on our Berwick furniture is often much quicker than full bespoke. 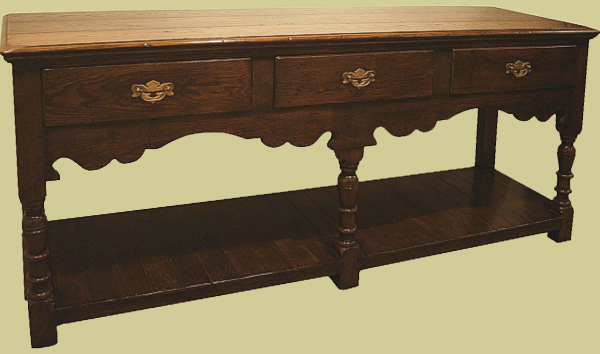 To see this dresser base in a stunning historic oak panelled setting setting, click: 3-drawer oak potboard dresser base in a 19th century priory. Also here in our clients Sussex home: Oak potboard dresser base in sitting room of Sussex farmhouse and here in the home of one of our clients, where we also restored their table and chairs: Restored antique furniture in old manor house in Surrey and another view here: Replica antique potboard dresser base in old Surrey manor, plus another photo a Sussex client kindly sent to us: Antique style oak potboard dresser base in West Sussex home.